The cog-wheels of industry grind forwards, and with them travels Ruin's Wheel, so beautifully evoked by Burns in Strathallan's Lament. Evil besuited developers with future plans are set against spooks in hoodies who creep through their derelict shells, taking photos and poking fun at the owners. Yet both the property capitalist– whose professional life is led by the precepts of Adam Smith and David Ricardo– and the urban explorer– following the example set by Oxygen Thief, the Riddlers and Lost– share a common capital. Neither are architects, but both groups take a real interest in old buildings– an interest beyond the boredom with which folk in the quotidian world regard architecture. Further, both can read buildings analytically, a skill often wholly lacking in non-architects. Most tellingly, both camps are ruled by the Law of Diminishing Returns. Adam Smith is famous for his Wealth of Nations, the publication of which effectively created capitalism; but David Ricardo, who was inspired by the Scottish economist's work, is also still relevant today. According to Smith's analysis the economy possesses unlimited upward potential; David Ricardo maintained that the economy generally moves towards a standstill. Ricado coined the Law of Diminishing Returns– a phrase we drop casually into conversation, a little like "Catch-22", perhaps without realising its origins. Ricardo had an instinctive grasp of the free market, and he understood that opportunities to make easy money are taken first. The simple projects on prime sites make large returns, but once the market progresses, and the uncomplicated propositions have been taken up, then you're left with difficult, expensive-to-develop projects. At this point, the expected returns diminish due to the increased costs, and the economics of the development move towards a point where costs equal returns- the static state which Ricardo predicated. If you don't make a profit, then what's the point of development? Everything grinds to a halt, and the bombsite, ruin, or abandoned building is left alone for things to "improve". Meantime, the derelict buildings haven't been completely ignored. Despite palisade fences, angry security guards with ginger hair, and motion-sensing CCTV cameras, the urban explorers seek them out. Using wheeliebins as stepladders, they flit through empty corridors, recording abandoned places using digital cameras, then sharing their finds on the web. They go where conservationists fear to tread, and create a digital archive of departed structures. 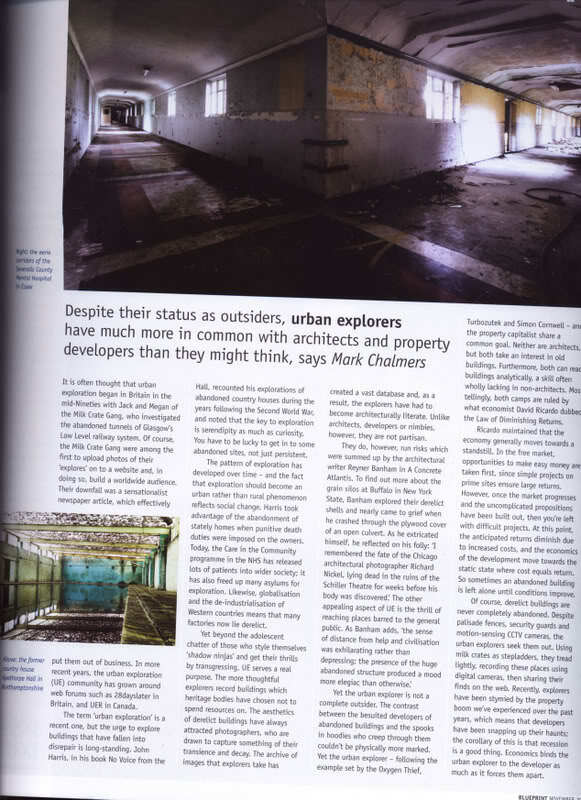 The urban explorers– or "urbexers"– are hit by diminishing returns because a property boom, like we've experienced over the past few years, causes developers to snap up their haunts, turning them into building sites. Paradoxically, recession is a good thing, and the trough in the economic cycle at the start of the 1990's was an opportunity. Manufacturing plants closed down, and the NHS abandoned its policy of institutional care– so the emptied factories and asylums entered the public realm, freeing to be explored. The corollary of this is that high property prices are a bad thing. However, the top of the market has been called, or at least economists believe we've now hit the highest point. Perhaps we've almost reached the static state which Ricardo predicted: certainly, we can no longer afford to buy property, despite 125% mortgages calculated on 6 times earnings, and running to a term of 50 years or more. Development work will grind to a halt if higher yields are available elsewhere, such as the stock market, the futures market, or particularly in private equity funds. Abandoned buildings, then, may be left alone for the next few years. How many urban explorers understand these fundamentals which rule their world? They're probably about the same in number as the property developers who appreciate old buildings for their own sake, and want to experience them as they are, or even preserve something of them for posterity– like the explorers do.